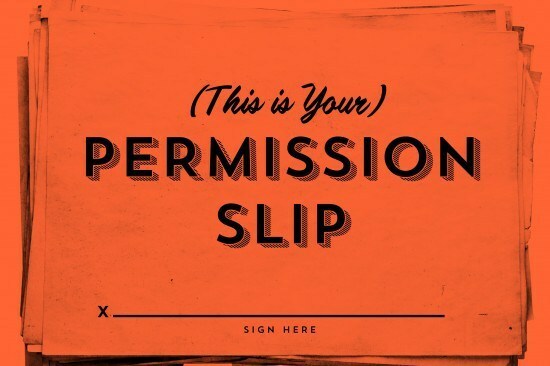 This month I've been discussing the idea of "permission" in a spiritual context with the community I serve in Columbia, Md. We've spent the entire month circling around the idea of what it means to give and receive permission for a myriad of things. Giving ourselves permission to be genuine with the world around us. Giving others permission to be just as human as we are. Making agreements with others in order to give one another permission to act together and do bigger and greater things. All of these came to a head today as I spoke about the importance of giving God (or whatever you choose to call that power that's greater than you are) permission to begin working on creating the life you actually want. There have been so many times in my life, today included, when I have been given a choice to either try and be clever and repeat the patterns of my past or to choose to have trust and faith in the idea that God is willing to support and nurture my wildest dreams. You see, when we try to out-think the world around us we are destined to fail. Not because there is anything wrong with us but because look at ALL the other people who are thinking just like we are. We are outnumbered by the sheer volume of thought happening all around us. There is no way we could possibly be so cleaver as to think we can "manipulate" everyone and every situation to end up exactly how we want it. This brings me to the root of my point. Dr. Ernest Holmes said, "There is a power for good in the universe available to anyone and you can use this power for good in your life." If we truly believe this to be true then there is only one thing that keeps us from experiencing all of that good whenever we want. We haven't given God permission to work in our favor because we haven't acted like God will do its part in the process. In this way God is still working for us. But God doesn't decide for us, we must decide for ourselves. If what we truly feel and believe is that God cannot deliver all of the good to us we need then we will experience a lack of good. Not because the good is not there, ready and waiting for us. The only reason we see lack is because God is making good on its promise to deliver whatever we are willing to ask for, and in this case we have stated that we cannot have good and so God delivers us none by our own decree. If we were to actually engage these principles by asserting our worthiness and by knowing that God not only can but IS delivering on the promise at all times then we begin to permit it to demonstrate greater good in our lives. When we say, "Yes, There is a power for good and it is already right here filling my life with more goodness." then we're off to a good start! The key now is that we act like it, feel that it's true and begin to live the life we imagine to be good. That is how we give permission for the good to flow. Not to say it, not even to think it. We must know it and be it over and over again. Since we believe that God is all there is, we also believe that it is all we are. That means every word we speak is God's word(s) being spoken. So if you are waiting for God's permission to have more good in your life then on behalf of God... let me be the first to grant you permission to be amazing. You are meant to express good and to be the conduit through which more and more good enters the world. Give God permission to do the work and act like it is being done and it will be so.